Chemical Constituents and Components : Main chemical components are camphene, pinene, myrcene, phellandrene, terpinene, p-cymene, limonene, 1,8-cineole, linalooloxide, terpenolene, p-cymene, benzyl cinnamate and benzyl acetate. Volatile oil: 1. It causes inhibitory effect on both gram positive and gram negative bacteria. 2. It inhibits the growth of fugal strains. Mucilage: 1. It increases the glucose level and glycosylated hemoglobin in diabetic patients. 2. It decreases the lipid peroxidation. 3. It stimulates macrophage functioning. 4. it causes significant elevation in the GSH (glutathione) concentration in liver, kidney, stomach, and intestine. Curing Diseases : 1. 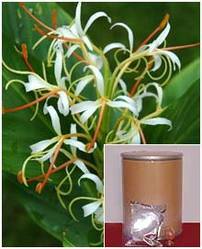 It helps in the cure and treatment of dyspepsia, stomachic, diarrhea and liver disorders. 2. It acts as potent antibacterial agent. 3. It helps in the curing of skin disease, fever and ulcers.